First-Class Wine and Gourmet Basket. Send this basket to those you wish to impress or congratulate. Two premium wines (your choice of two red, two white, or one of each) or one bottle of distinctive champagne are nestled in a traditional basket filled with an array of delicious foods guaranteed to be relished. 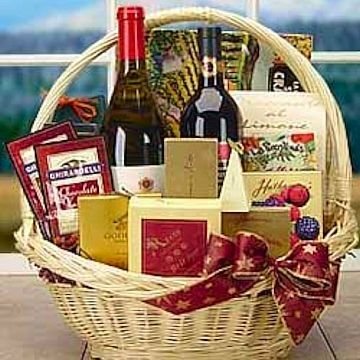 Imagine the delight of the recipient when a basket bursting with a variety of specialty crackers, cheese, dips, smoked seafood, cookies, candies, teas, or coffees arrive. When only the finest is required, this basket is a perfect choice. Specific basket design may vary based upon location and availability. Exact basket and gourmet selection will vary by delivery location.